NAIROBI, Jan 3 2012 (IPS) - The acute lack of water in Kenya means families have to trek long distances every day to fetch water. In both rural and urban areas, people often walk as far as 30 kilometres or more to collect water from rivers, streams or wells. But thanks to self-help projects backed by NGOs, some communities are coming up with solutions. Over 80 percent of the country’s population of 40 million has no access to clean water, according to the World Water Organisation. Those who live in dry northern or eastern regions and parts of the Rift Valley spend days in search of water for domestic use and for their livestock, their economic mainstay. Fighting and quarrels at water points are rampant as women, men, children and animals battle for the little water available. And women who stay out late fetching water risk getting raped. “Lack of water in Kenya is associated with the high mortality rate among children under five years old, which is primarily due to waterborne diseases such as diarrhoea, malaria, and amoebic dysentery. Contamination from human and livestock waste also causes water-related diseases,” Dr. Joram Mwangi at Eldoret’s Moi Teaching and Referral Hospital told IPS. A majority of Kenyans have to cling to the little they have for cooking, and forego other things like washing. “Bathing and washing are a problem. We go even for three days without having a shower, because water is expensive. In fact, more expensive than food,” Gaudensia Achieng from Kondele village, outside of Kisumu city on the shores of lake Victoria, told IPS. Ironically, Lake Victoria is the second largest fresh water lake in the world. The Ministry of Water and Irrigation transferred the management and operation of water services to the Water Services Boards (WSBs) in 2005. The ministry and the government as a whole have been blamed for failure to address the problem by adopting policies to provide clean water. He added that the government should train nomadic people in irrigation, provide them with farm inputs like fertiliser and seeds to embrace agriculture, and work with non-governmental organisations, community-based organisations and other self-help groups to dig boreholes across the country to address the problem. It is through the intervention of one such NGO, ActionAid Kenya, that a whole division in the Rift Valley region has water and its residents have embraced farming. The happiness written on the face of Loice Kitilil, one of the residents of the division, shows her life has changed for the better. Gone are the days when she had to walk up to 20 kilometres to look for water with her child perched on her back. Tired of the harsh conditions faced by women in Tangulbei division of East Pokot, Kitilil joined 27 other women and 22 men to found the Kadokoi community water project in 2009. Tangulbei is a dry area in the Rift Valley region of Kenya, about 350 kilometres from Nairobi, the capital city. Tangulbei division has 40,000 residents. Divisions and districts are administrative units in Kenya. A drought in the area recently killed people and livestock. The residents are nomadic pastoralists who depend on livestock for their livelihoods. Women are not allowed to own any property and are supposed to stay at home to bear children and perform domestic chores. It was the difficult living conditions as well as the failure by the government to implement sound water and agricultural policies that prompted the group, through its committee chaired by Philemon Akwija, to approach ActionAid Kenya and ask them to help solve their water problem by helping them dig a borehole. ActionAid responded by digging them a borehole and providing them with a water tank and solar panels, while the group members supplied stones, sand and ballast for construction. Then like manna from heaven, over 3,000 families were all smiles when they were able to draw clean water, in 2009. “It was like a miracle for me. I couldn’t believe that now I will be able to walk for 20 metres to fetch water, instead of the 20 kilometres I used to walk earlier,” said Julia Motii, the group’s director. But the “miracles” did not stop there. In early 2011, officers from Farming Systems Kenya, a local NGO that specialises in agriculture, came knocking with more good news. They told the group that they could also use the water by engaging in irrigation. “We knew nothing about farming, but officers from ActionAid and Farming Systems taught us farming basics and told us to adopt drip irrigation which they said suited our area. We then raised money to hire a tractor to till three acres close to the borehole. We have now embraced farming,” William Akeno, the group’s vice chairman, told IPS. The group members were then given seeds by the government to establish a seed nursery. Their farm now has fresh onions, kale and tomatoes. “We started harvesting our crops last month. We are the only suppliers of onions, tomatoes and kale in the entire division. We make an average of Ksh700 (8.25 dollars) daily. We alternately sell or give free vegetables to our members,” said Motii. Esther Orot, a group member, is a very happy woman now. “My family used to go hungry for days because of lack of vegetables. We used to send a matatu (minibus) driver to buy us vegetables from Marigat, 80 kilometres away. Sometimes the minibus crew would fail to come back, or would come back and say that there was no vegetable or the money was lost,” she told IPS. During a visit to the project’s site, Geoffrey Okoth, ActionAid International advisor for Emergencies and Conflicts for Eastern, Central and Southern Africa, commended the members for their good work. “This is a successful model that can be replicated in the whole region to prepare communities’ resilience against disasters like hunger. If by tilling three acres, you can harvest this, then it means with good farming methods, you can reap more,” Okoth told IPS. He challenged the men to shun bad cultural practices and help their women in farming, promising them that if the men responded positively, he could commit more funds to the project. “ActionAid works closely with women because we know that empowering a woman is empowering the nation. If women have resources, it means their families will have food; their children will go to school. I challenge the men to relinquish their positions in the committee to women and see the results,” Okoth said. 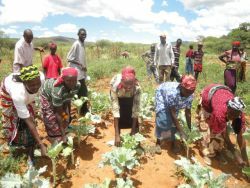 Philip Kilonzo, ActionAid Kenya’s advisor on livelihoods, urged men to play a bigger role and asked the group members to identify hard-working members, divide them into groups and allow them to cultivate different crops on different plots. “Let the members be trained in basic extension practices so that they can understand the new farming dynamics, so that they can use the shamba (plot of land) sustainably and reap maximum benefits,” he said. Richard Leting, the District Agriculture Officer, promised to work closely with the members. “I will train them and advise them on which crops to grow. I will also make sure they apply for agricultural grants from the government to expand. I will organise exposure tours for them so that they can learn from others,” Leting told IPS.